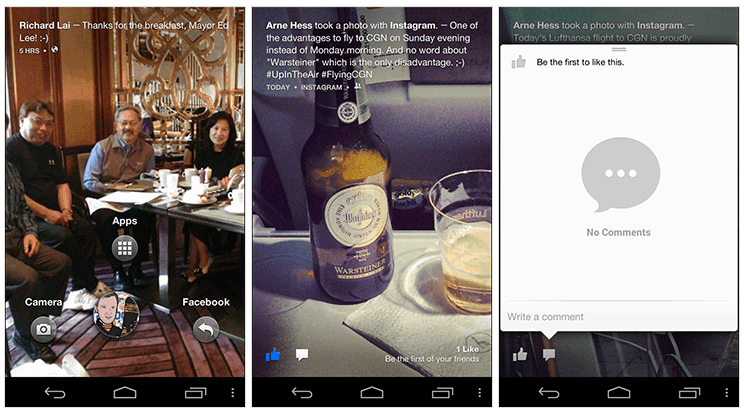 Facebook Home: Who's Really Coming to the Housewarming Party? At this point you're sure to have seen some branch of Facebook's marketing campaign for their new super app Home. Personally the one that comes to my mind is of a Facebook employee getting soaked by waves while scrolling through his friend's beach pics, when he should really be listening to his boss Mark Zuckerberg's speech about their new product. However this distracted employee might not be missing much after all given the download trends of the new Facebook Home since it's release last month. The app is free, available worldwide, and has over a million downloads so far; which would be much more impressive if Facebook didn't have over a billion active users. What salts the wound is that three-quarters of that billion use their mobile device as their primary means of visiting the site. So why aren't all of these users embracing the company's new Facebook Home? Well as I said, they've been on the offensive as far as marketing their new product so the word is out there that it's available. The big problem is that Home is only supported on five devices so far, and all of them are still fairly new. Facebook has said that this exclusivity is intentional as a means of beta testing the product and ironing out all the wrinkles before making it available to all. However as a consumer, the last thing I want to be told is that I need to buy a new, expensive piece of equipment to catch the carrot being dangled before me. Not to mention that the handful of users with the new proper devices, probably only emptied their wallet for them because they are tech savvy enough to know their ins and outs. This implies more likely than not that once the other users "catch up" to the Home users, the last thing on their mind will be downloading the app or trying to wrap their head around this new socially interactive operating system if it hasn't already dissuaded them from purchase. However the idea is intriguing and new, so one can only hope that Facebook brings a can of Raid when working out the bugs so they will have a product they can flaunt by the end of the year. So far, "test users" have highlighted some of their favorite features as Chat Heads to keep them in engaged in messenger conversations, and the Cover Feed allowing them to stay up to date on their friends statuses and photos. Not to mention Facebooks legendary interface updates to look forward to once they begin modifying the app based on user reviews in the Google Play store. As a Facebook user and a bit of a social butterfly, I can't wait to see what grows out of Home in the future and am glad that the company is sticking to their mission of keeping the users happy and connected before worrying about download numbers or profits.